The airport is a hub for Air New Zealand thereby linking many national destinations as well as providing international flights to destinations in Australia and the Pacific. The airport has limited room to expand as it is surrounded by residential properties and a golf course. But a new terminal was finally finished in 1999 after several decades of making plans. Which airlines fly to Wellington International Airport? Where is Wellington International Airport located? The Wellington International Airport is located just 5 km south-east from Wellington city center. How to get from the airport to Wellington city centre by public transport? You can also take the Airport Flyer, a premium public bus service with specially designed buses with a wide door and low floor for easy access. It will ply the route between the Airport, Wellington City and Lower Hutt for a fare of $6 to $12 depending your destination. You can also walk outside the airport (ten minutes) to a bus stop of Route 11 which is a cheaper, regular bus service. How much does a taxi cost from the airport to Wellington city centre? All the major car rental are of course available at Wellington International Airport and also a taxi would be easy to find. Taxis are waiting at level 0 outside the baggage claim area of the main terminal. Expect to pay about NZ $30 to 40 for a ride into Wellington. Door-to-door shuttle busses (Super Shuttle) also operate at Wellington Airport, near the taxi stand. 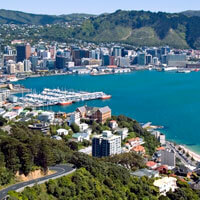 What are popular destinations from Wellington International Airport?